Whew! Hello, all! It's been a busy week for both of us as we hunker down and get to work on upcoming conventions. 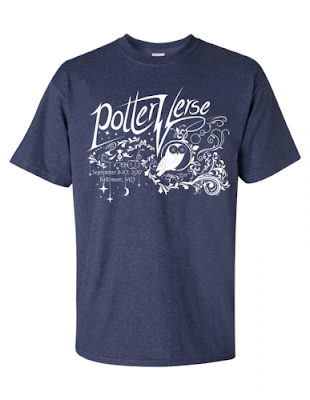 For starters, check out Ginger's awesome design for the PotterVerse shirts! Shirts are $20 for size S-XL, and $25 for sizes 2XL-5XL. There will be a few to buy at the merch table in common sizes during the con, but if you want to be sure of getting one, your best bet is to order beforehand. Register now to hang out with us in Baltimore this September, and be sure to add a shirt or two to your registration! Speaking of cons, Kara will be at Anime Mid-Atlantic starting a week from today in Norfolk, VA! She'll be hosting karaoke for her 11th year running Friday night at 9 PM. Be sure to come hang out if you're in the area -- and remember, the con has moved to the Norfolk Waterside Marriott this year! Keep an eye out for more cool stuff coming soon!